Today, we bring you an edition of Richard III adapted and published by J. 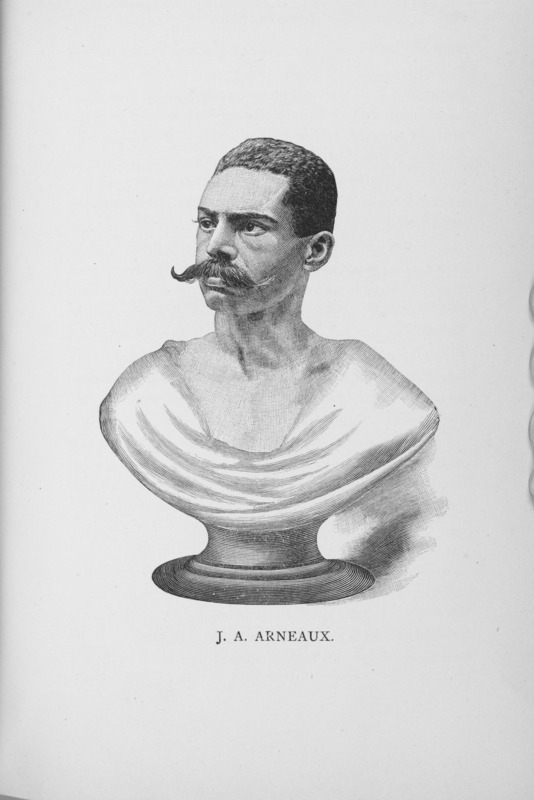 A. Arneaux, one of the leading black actors on the late 19th-century New York stage. John A. Arneaux was born in Georgia in 1855, to a Parisian father and an African-American mother of French descent. He moved north to New York around 1870 to study German, Latin, and French, later traveling to Paris for further study. At some point his interests took a turn and, back in New York, he began training and performing as a vaudeville artist. With encouragement from a local theater manager, his first performance as a dramatic actor took place in 1876. Almost a decade later, and with apparently little other theatrical experience in the meantime, he joined the Astor Place Company of Colored Tragedians, and appeared as Iago in an 1884 production of Othello. His performance was favorably received, and the New York Daily News described it as “the best and truest in the entire cast.” Around this time, Arneaux also began managing the Astor Place Company, founded during the previous decade by his friend and fellow actor Benjamin J. Ford. The next year, Arneaux starred as the title character in the Astor Place Company’s production of Richard III. Once again, his performance received rave reviews. Throughout 1886, the Astor Place Company traveled between venues in New York, Providence, and Philadelphia, performing Othello and Richard III. Engraving of J. A. Arneaux, with the elaborate handlebar mustache he grew for his portrayal of Richard III. Digitized by the Schomburg Center for Research in Black Culture, Jean Blackwell Hutson Research and Reference Division, The New York Public Library. While pursuing his acting career, Arneaux was also a journalist and editor. He wrote feature articles for several New York papers including the New York World and the New York Sun, and even ran his own paper, the New York Enterprise, although that publication ceased when its office burned down in 1886. It is probably through his journalistic career that he developed the connections which allowed him to independently publish his own edition of Richard III. Despite his brief but successful career as both actor and journalist, Arneaux was disheartened by the difficulties of supporting a black newspaper in the late 19th century, not to mention its sudden cessation. In the summer of 1887, Arneaux retreated to a hotel in the Catskills to rest and think about the future. Interviewed by the Washington Bee in August 1887, he shared his plans to sail for Paris, and continue his study of the theater there. Unfortunately, Arneaux’s life becomes rather mysterious at this point. We know that he lived in Paris for the next decade, and planned to return to the United States, but there is no record of his ever having done so. 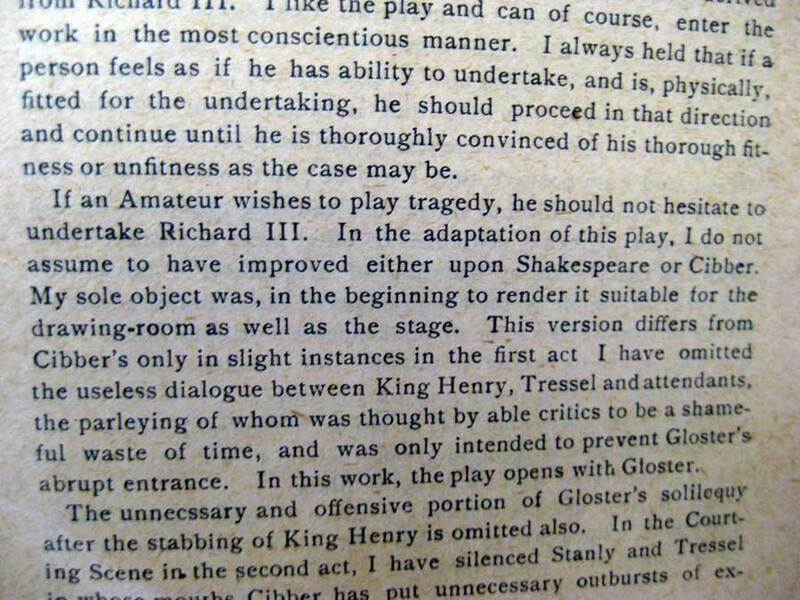 Interested in staging a revival of Arneaux’s Richard III? It has been digitized by the HathiTrust project, and is available in full online. To learn more about Arneaux and other black Shakespeareans, look for Shakespeare in Sable by Errol Hill, published in 1984, at your local library.